Branson has some of the best budget friendly restaurants that will definitely satisfy your taste buds. As one of the most popular vacation destinations in the Midwest, Branson is not only famous for its live entertainment shows and exciting attractions but also for its shopping and dining opportunities. Dining in Branson is one of the things that is always on the list in every visitor’s itinerary. With so many exciting activities that you can enjoy around the Trilakes area, it’s no wonder that Branson is a favorite vacation destination. If you want to experience unique dining in Branson, check out the top 3 cheap restaurants such as Rocco’s New York Style Pizza, The Hungry Hunter Restaurant, and Billy Bob Dairy Land Restaurant. Rocco’s New York Style Pizza by Mama D’s House Restaurant is home to delicious garlic knots and pizza. At Rocco’s New York Style Pizza, you can taste the best pizza ever. Everything in this restaurant is prepared fresh and made from scratch daily. You’ll enjoy some of the best New York pizza in this beautiful dining spot in Branson. The homemade garlic knots with the butter sauce are what the customers dying for. This family owned restaurant cares about their customers and go out of their way to make everyone happy. This quiet restaurant is home to amazing pizza and great salad with very reasonable prices. The pizza in this restaurant has a robust flavour, crust has the perfect crunchy. This place is a must visit when you spend your next vacation in Branson. The Hungry Hunter Restaurant is another cheap restaurant in Branson where breakfast is served all day. If you like chicken fried steaks or pork tenderloins, you’re sure to love what’s offered in this restaurant. The food served in this restaurant is hand cut and cooked to perfection. 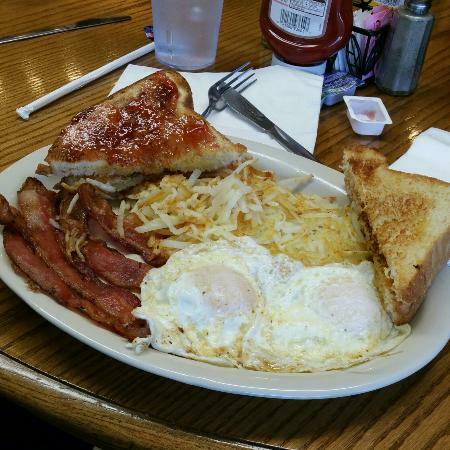 You can eat as a sandwich or with some yummy hash browns and eggs. You can also have their warm gooey cinnamon rolls if you want to satisfy your hungry stomach. Although known to offer cheap eats in Branson, this restaurant always serves excellent food and the portions are always large and they also serve best biscuits and gravy. This little hidden gem in Branson will always win the heart of every customer because they serve amazingly delicious homemade dishes. At Billly Bob’s Dairyland, you’re sure to enjoy cheap dining in Branson where you’ll remember burger joints in small town America. If you’ve longed for a dining spot like the ones you see on old TV shows, you can enjoy that right here in the heart of Branson, an honest-to-goodness throwback restaurant. Billy Bob’s has nothing special in their menu, just plain good burgers, hot dogs, a few sandwiches, and ice cream. Their burgers are now famous in Branson, you can get them with cheese or without, in a basket with fries, and doubled up. So, if you are looking for a budget friendly restaurant in Branson, try these top 3 cheap restaurants, they can definitely satisfy your taste buds.